Sometimes amazing rums come into being, made by people you’ve never heard of, blindsiding you with creative genius. Here’s one from Denmark. Often, writing about a rum that is good with flashes of great leaves me with the vague feeling of dissatisfaction, because it seems that with a little more effort and imagination and maybe even chutzpah, it could have scored higher, been more, wowed my socks off. How often have I written “excellent work, but…”? The Danish made Norsk Cask, which I bought together with Henrik of Rumcorner, was a rum that neatly sidestepped those concerns and has proved to be one of the best Demeraras I’ve ever had. It shows that Velier and Silver Seal and Moon Imports aren’t the only ones who can create rums with full-proof iron-man jockstraps. 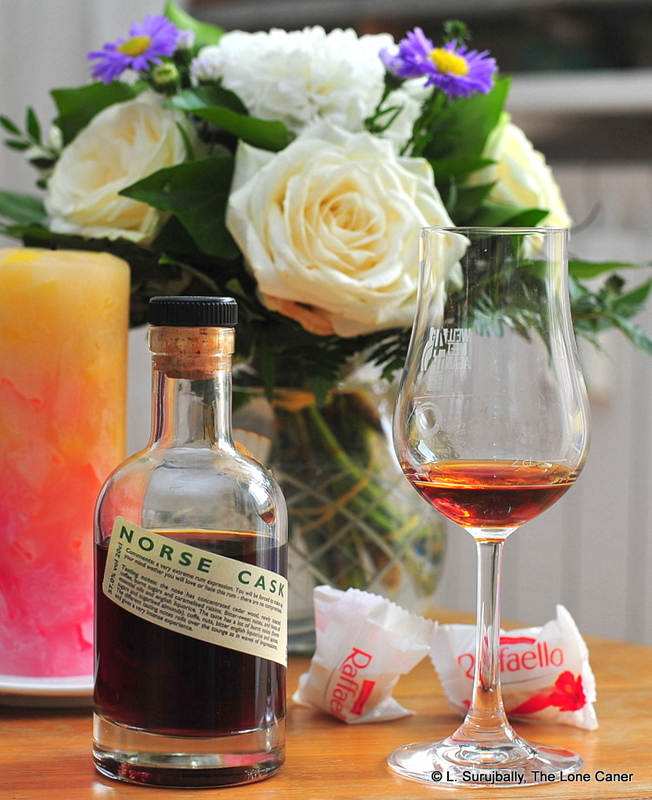 A few words about Norse Cask, once headed by a gentleman called David Larsson. Apparently he was behind a company called Qualityworld, which imported several brand name spirits as well as doing some independent bottling. Unfortunately, during the economic crisis in 2008 the bank pulled the plug on his company and it went belly-up – to our detriment, I suggest, because this guy, just on the basis of this one rum, sure looks like he knew how to pick ‘em. Think I exaggerate? Not in the slightest. What we had here was a rum with a strength on the exciting side of 50%, a 57% dark red-brown rum aged an amazing 32 years (no information as to where) that exhibited a nose strong and fragrant enough to make Velier take a step back and mutter a disbelieving “Che cazzo?” (and then rush to buy one). The nose started out a little sharp, not too much, fading rapidly to heat, and exuding initial aromas of bananas, licorice and a little rubber tap on the schnozz. 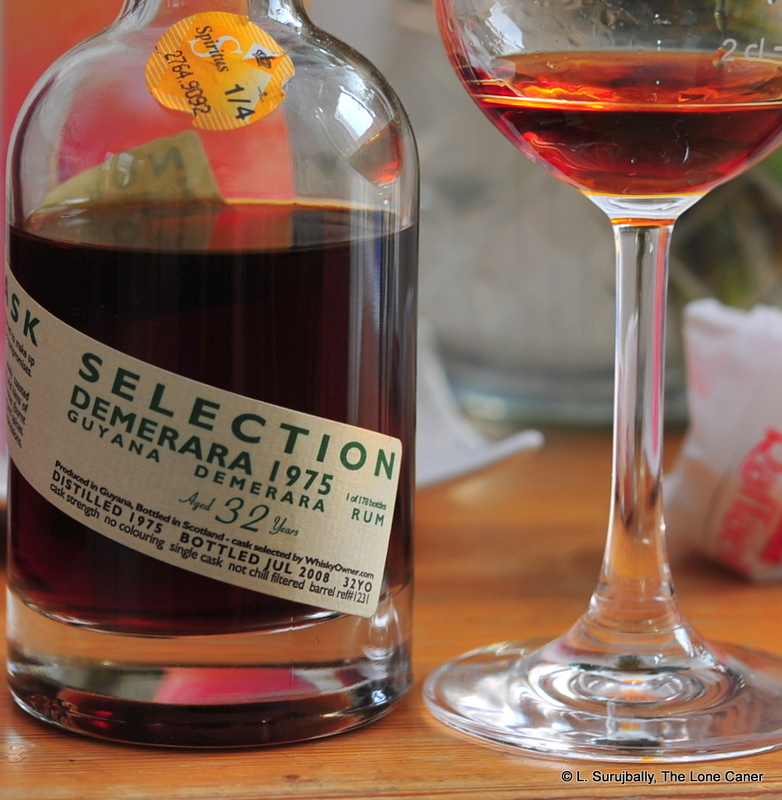 Man this rum was deep – I had almost forgotten what an aged-beyond-all-reason Demerara could smell like. Black pepper, dark chocolate, coffee, cedar, lemon zest, anise and burnt sugar marched in stately progression across my nose. And then this rich smorgasbord was followed by licorice, more brown sugar, red currants and elderberries, with some musty hay notes. Wow. Just…wow. The palate didn’t drop the ball, and continued to elicit my admiration: it was really well put together, rich to a fault, and I felt that not one year of the 32 was wasted. 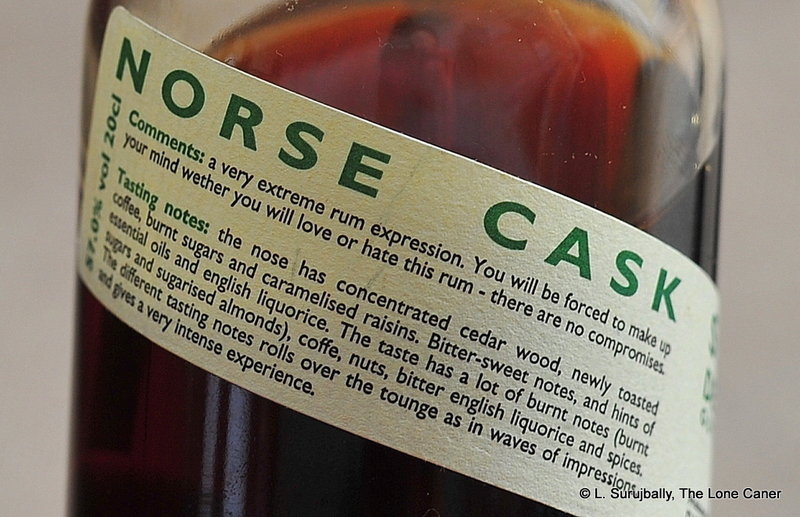 I scorned the A.H. Riise Navy rum as an abominable sugar grenade – this restored my faith. Raisins, dried black fruits. Esters lurked coyly in the background. Flowers, apricots, lemon rind. Some woodiness and tar was present, well held in check, more cedar, olives in brine and (get this!) a weird faint taste of marmite on jelly on a slice of rye bread. It somehow married the sort of supple sleekness that would give a mink nightmares with the heavy, massive stomp-’em solidity of a Clydesdale. And the finish? Medium long, yet very memorable – rich with black olives, sawdust, wood and some smoke, port, raisins and giving with all the love of a repentant ex-girlfriend. I tried it in conjunction with (among others) a similarly aged Cadenhead from 1975 bottled at 40.6% and it eclipsed them all without busting a sweat. So for once there are no qualifiers. No buts, howevers or althoughs. There are just wistful wishes: I wish I knew more about the components; I wish there were more like it; I wish the bottle were bigger. It’s so good I’m going to hoard this one and jealously guard it like a knight of old with his daughter’s chastity. A lesser rum would be about trying to summon maybe one or three clear (maybe even contrasting) tastes, and balance them uneasily, sometimes not well. This rum, which breathes, which challenges, which is excitingly alive and complex to a fault, wants to see each note as part of something better, a greater whole, a synthesis…a whole symphony. And melds them in a way which is quite remarkable. It’s a great Demerara rum. No, scratch that, I lied. It’s a spectacular Demerara rum. Distilled 1975, bottled July 2008. Many thanks to Henrik for the history of Norse Cask.